The West Virginia. Center for Civic Life is a nonpartisan, nonprofit organization that helps engage our citizens in community discussions of important public issues that affect our state and nation. What can we do about prescription drug abuse? Over the past decade, the abuse of prescription drugs in West Virginia has increased among adults and youth alike, with profoundly negative impacts on individuals, families and communities throughout our state. Prescription drug abuse is an extremely complex issue requiring the involvement of nearly every sector of the community: law enforcement, education, health care, churches, businesses, neighbors, government and social services. In order to consider ways to address prescription drug abuse, local organizations are sponsoring community discussions to bring people together to consider what can be done. Between July and December, 2010, over 125 community forums have been held in over 35 West Virginia counties—followed by local action planning sessions. We hope you will consider convening a forum in your community. The following materials may be downloaded and duplicated for your discussions. 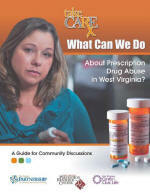 Prescription drug abuse in West Virginia is one of the issues developed by The West Virginia Center for Civic Life for discussion and action in deliberative forums.